Automotive seating giant Lear faces no existential threat from the phasing out of the internal combustion engine. Short term issues cloud a high quality and growing market leader in adventure tourism. Value investors have been doing it tough. When the tide eventually comes in, it will come in faster for those who can adapt. That’s what Charles Heenan from UK fund manager Kennox asked the more than one hundred investors recently assembled at ValuEspaña in Madrid. It was a particularly relevant question. The mood at this year’s conference was decidedly downbeat—a significant proportion of people I spoke to shared our tough year in 2018. Resolve is important, undoubtedly, but so is reflection. And if, upon reflection, we need to adapt, then resolve shouldn’t get in the way of adaptation. There is only one fundamental truth about value investing. The worth of a stock is the present value of the future cash flows that it is going to provide to its owner. If you buy it for less than that value and collect the cash flows you anticipated, you will earn above average returns if you hold the stock forever. You will earn more if the share price rises in the interim. Working out what those cash flows are going to be is the challenge, of course. 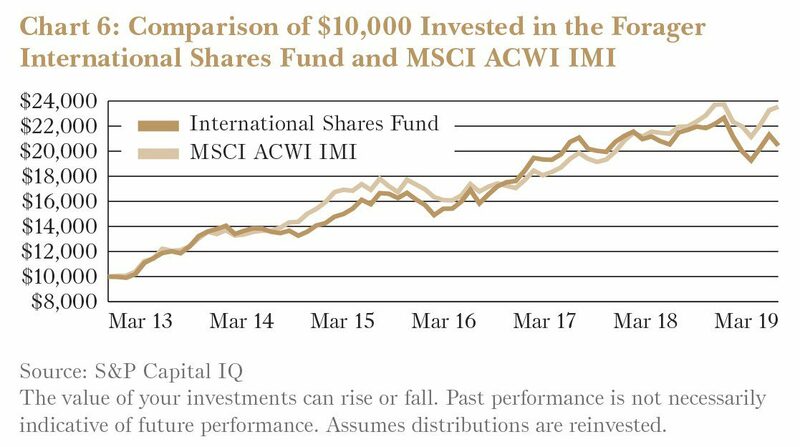 My fellow value investors are frustrated that the fund managers who are doing well are most often invested in “growth” stocks where there usually seems to be little connection between immediate cash flows and share price performance. Online supermarket Ocado was the best performing idea from the conference three years ago. The stock price is up more than fourfold and some £8bn has been added to the company’s market capitalisation in a period where its profitability went from just positive to a £40m loss. Ocado has signed some big deals to sell its platform to traditional grocers, including Coles in Australia, but it exemplifies the challenges of focusing on cash flows when all the market rewards is growth. Indignation aside, however, most of us would admit that many of our “value” stocks haven’t been producing their anticipated cash flows either. The reasons are perhaps less transitory than many of us realised, and it is here that we need to adapt. Historically, a company’s tangible assets were a useful north star for the value investor seeking a path to understanding future cash flows. Far from infallible, sure. But useful nonetheless. While the prevalence of asset-heavy businesses has been on the wane for decades, these companies still exist. And you often find value investors, including us, sniffing around them in times of distress. MRM Offshore and Boom Logistics are two current examples in the Forager Australian Shares Fund. You can still make money if you buy these businesses at a cheap enough price—Boom is a good example—but it seems a lot harder than it used to be. Firstly, time kills the investment thesis on asset heavy value stocks. Most value investors see a stock trading at half its tangible asset backing and therefore think it is worth twice the current market price. That might be true eventually, but the key question is: when? A share that is going to be worth $1 in three years’ time is only worth $0.75 today, assuming you want to earn a 10% return. Our overly optimistic brains tend to dramatically underestimate the time to recovery in these cyclical businesses. However long you think it is going to take, at least double it. additional discount to asset value. Add the time discount and the return discount and you can easily imagine needing a 50% discount to tangible assets to make an asset-heavy investment stack up. And that’s before you demand a margin of safety. Interest rates might rise at some point but it doesn’t seem likely any time soon. Wider discounts are with us for now. INDIGNATION ASIDE, HOWEVER, MOST OF US WOULD ADMIT THAT MANY OF OUR “VALUE” STOCKS HAVEN’T BEEN PRODUCING THEIR ANTICIPATED CASH FLOWS EITHER. These asset-heavy businesses are, in any case, a shrinking part of the market. Most modern businesses rely more on intangible assets than land and machinery. The growing importance of intangible assets is nothing new. It was the lack of tangible assets that made newspapers and televisions the best businesses in the world for many decades, and created many of the world’s richest people. But there’s no doubt that the intangible is becoming increasingly important. And there is one aspect to these businesses that is consistently underestimated. I wrote a blog recently titled Momentum Matters for Value Investors. The idea being that, in this intangible world, success breeds success. Culture Matters for Value Investors would have been a better title. Growth is an important component of culture. People want to work for a business that is exciting and offering opportunity. But there are many other factors, and often growth alone can be quite destructive. When it is well established and humming, however, a successful culture can be a strong source of competitive advantage that is difficult to replicate. While Seek and Carsales have an obvious source of their intangible value—network effects—what is it that has made Flight Centre and Macquarie Group two of Australia’s most successful businesses? They might be giants in their respective industries today, but they started as minnows in highly competitive industries. There are some similarities between the two companies. Both have benefited from industry growth. Both have incentive systems whereby a majority of staff income is closely linked to shareholder outcomes. Once the culture became successful, it fed on itself. And the runway is longer than ever before for a lot of listed companies. More and more businesses easily cross borders. It’s obviously true for online businesses, particularly software. But it’s increasingly true in sectors like retail, too. Zara and Uniqlo are truly global. Some Aussie businesses, like ASX-listed Lovisa and Premier Investment’s Smiggle, are making a decent fist of going global themselves. Consumers are less different, supply chains are easier to build, communication cheap and there is a growing pool of experienced global talent ready and willing to sell their experience. For some successful businesses, it has been a huge mistake to assume that the competition will eventually catch up. Sometimes the winners keep on winning. None of this is to say we should be jumping on the growth bandwagon now. It’s an immensely popular investing strategy at the moment, both in Australia and globally. Most growing companies are overpriced and there will be dozens of disasters for every long term success. But we do have to adapt to the world we live in. I have always maintained that value investors don’t use a wide enough range of valuation metrics. We tend to over-value shrinking companies and under-value those that will grow. With low interest rates seemingly here to stay and an increasingly intangible economy, the gap needs to be even wider than I thought. Recognising that might be the key to a happier conference next year. We welcomed Paul Quah to the Forager International Shares Fund investment team in February. His 20 year investing career started as a research analyst with UBS in Sydney, before setting off to Asia to live in Hong Kong for 9 years, and following that with roles at Acorn Capital and Ellerston Capital back in Australia. His Asian markets experience is going to add a lot of value to the team and the portfolio over the coming years. There are some long runways in that part of the world and, for now at least, particularly attractive equity prices. You will be able to meet Paul and the rest of the team at our annual roadshow in late July and early August. Tentative dates are provided below so you can block out your calendar. Before then we are planning a webinar separately to address recent performance issues. We will cover sources of poor performance, current opportunities in both funds and what we are doing to resurrect value. It will be at 12:30pm, Wednesday 1 May 2019. You’ll receive an email about this, I hope you can join us. An investing rule of thumb is that you make money from cyclical stocks by paying high multiples of low earnings, not the other way around. The global automotive sector, in contrast, has been reporting historically high profitability and now clearly faces a downturn. We’ve bought selectively. We may still be too early. The last three months of 2018 was all pessimism. 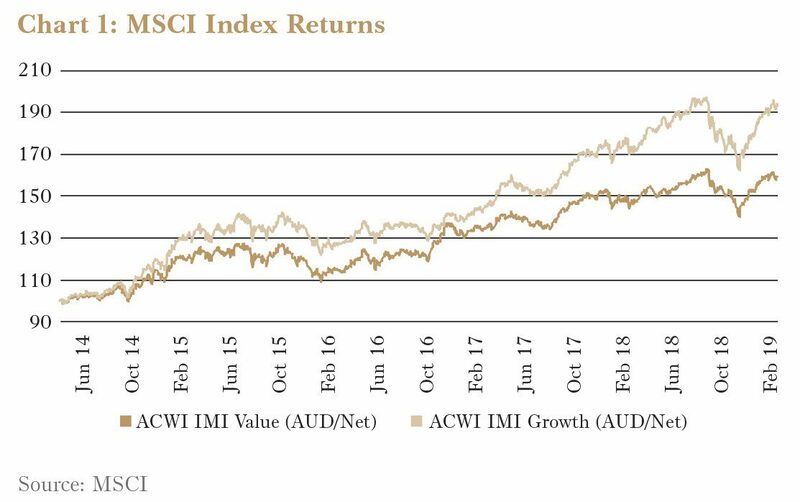 The MSCI All Country World Index fell nearly 11% in Australian dollar terms and the price of a barrel of Brent oil fell about a third. That seems a distant memory. Stockmarkets erased most of the preceding quarter’s damage in the first quarter of 2019. While you might have heard a lot about the oil’s collapse late last year, the reaction has been much quieter this quarter as it regained half of its prior losses. 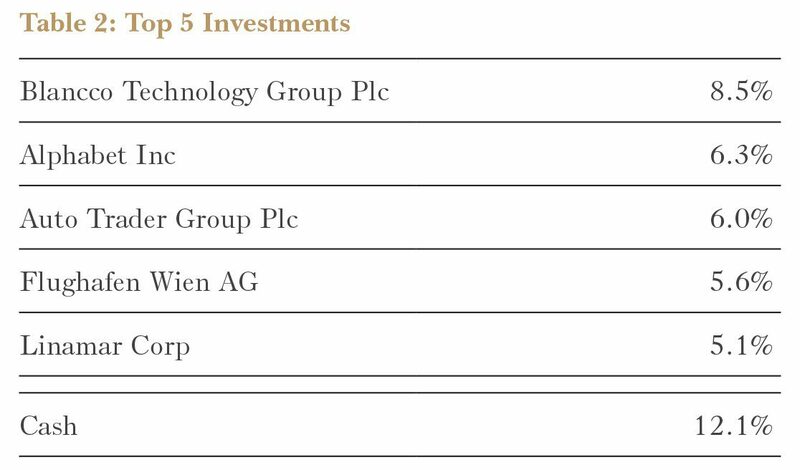 While the selloff was brief, we did add new investments to the fund during recent months, two of which are profiled below. The global automobile sector is in a tizz. Seasonally adjusted global auto sales have fallen about 10% over the first three months of 2019, with Chinese sales crashing almost 20%. The earnings of companies in the automotive chain might soon follow. If that wasn’t enough, there are also structural factors suggesting the sector’s future might be difficult. Established car makers are facing a dilemma of whether to invest to develop electric vehicles or let newcomers such as Tesla (Nasdaq:TSLA) gain market share. Car ownership is likely to fall as car hailing services such as Uber become more popular. And autonomous driving technology has the potential to lower the cost of these services, making them even more attractive. Investor pessimism about the sector is thus understandable. 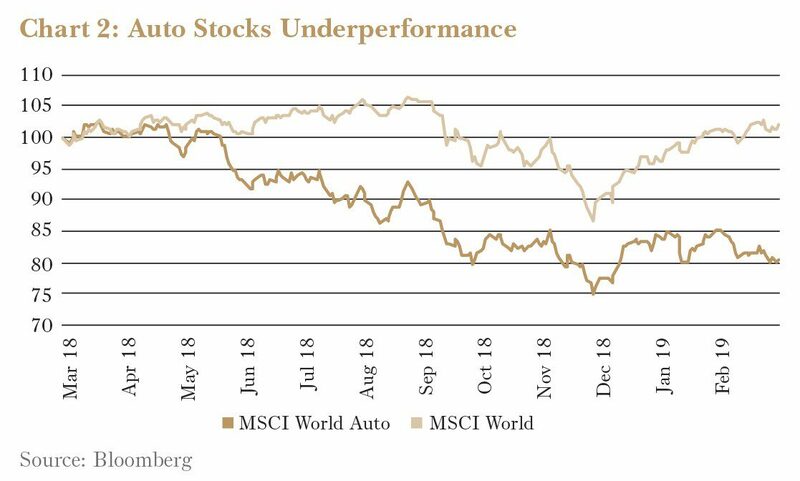 The MSCI Global Auto Index has underperformed the market by more than 20% over the past 12 months. But, at times of extreme change, investors can overreact. And no two companies are the same. We have been sifting through the sector in search of opportunity. An investing rule of thumb is that you make money from cyclical stocks by paying high multiples of low earnings, not the other way around. We are very cognisant of the fact that this rule has usually been right historically and have been treading carefully. There are, however, two stocks worthy of a tentative exception. Among auto suppliers Lear Corporation (NYSE:LEA) stands out. It is uncomplicated; 75% of its revenues come from supplying car seats. And with $16bn of annual sales, Lear is the second largest player with a 30% global share in a concentrated industry. The top four suppliers capture 80% of the market in North America and Europe and 65% in China. Competition, as a result, is not as fierce as in other more fragmented parts of the auto industry. 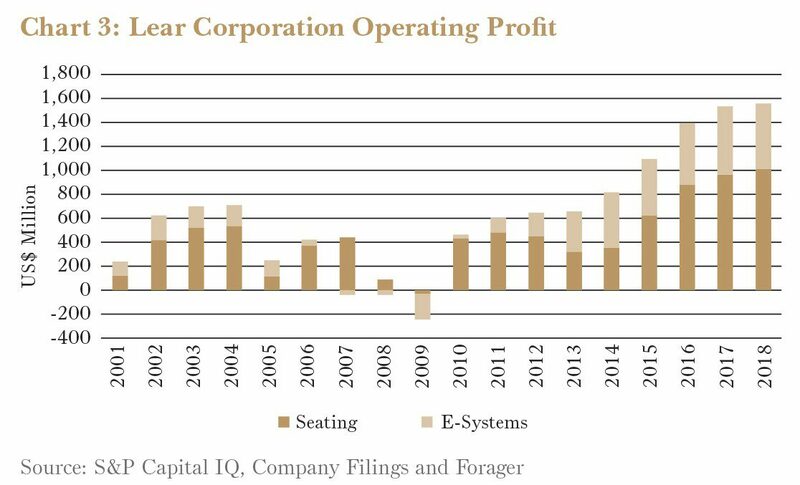 Most seat companies have earned a return on capital above 10% over the past decade. Lear has done better at 13%. Thanks to scale, Lear can make high quality car seats more efficiently than car manufacturers. Clients are unlikely to bring this work back in-house. Consumers don’t know or care that a seat’s construction has been outsourced. And while seats account for less than 5% of the total cost, comfort and reliability are an integral part of the driver’s opinion of the whole car. This isn’t an area to skimp. Especially in the luxury and larger car (SUV) categories where Lear is most present. Importantly, this business should continue to remain relevant whether cars are powered by petrol or battery. And whether the wheel is being steered by you, an Uber driver or a computer, all cars need seats. All considered, Lear’s seating business will suffer during a sharp downturn but it should perform well over the full cycle. Lear’s smaller E-Systems segment generates the remaining 25% of sales and one-third of operating profits. This segment sells components that form the backbone of a car’s electrical infrastructure, including wires, terminals and connectors. Additional safety and comfort features mean the average car’s electrical architecture is getting more complex with each new design generation. And the shift to electric vehicles should add further demand for such components. We think margins might fall over the coming decade, but sales growth should more than make up for it. Lear doesn’t need to hold a large amount of inventory, it assembles products on demand. And it outsources many components to third party suppliers which it then pays only after receiving money from customers. So, unlike most manufacturing businesses, growth doesn’t require a lot of additional capital. As a result, Lear has been able to pay out most of its profits to shareholders, mainly via share buybacks. Since 2010, the number of shares outstanding has halved. 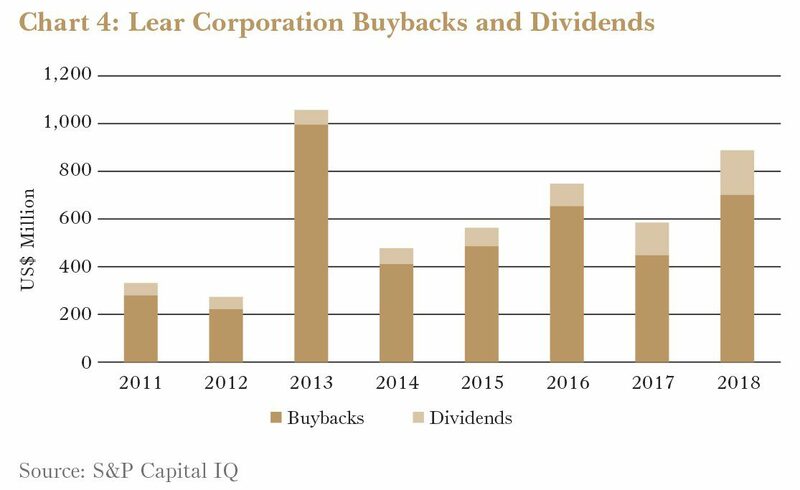 While cash available for dividends and buybacks will fall in a downturn, we value management’s willingness to reward shareholders during the good times. Factoring in a range of scenarios, we expect earnings to average $15 per share over the coming years (a 16% reduction on 2018), implying Lear is currently trading on a price-to-earnings of less than nine times. If our estimate turns out widely off the mark, the company has almost no debt and should be able to survive a tough downturn and thrive in the subsequent recovery. Lear is currently a small investment in the Fund but one we would like to add to opportunistically. Our second auto-related investment is Linamar Corporation (TSX:LNR). Unlike Lear, Linamar’s current business could be negatively impacted by a significant shift to electric vehicles. It trades at a much lower multiple of most recent earnings as a result. We think it is a dramatic underestimation of the strengths of this family-run business. Linamar was founded in Canada in the 1960s in the basement of Frank Hasenfratz, a Hungarian refugee and cost-cutting genius. While 84 year-old Frank continues to chair the board, he handed over the reins to his equally talented daughter Linda more than 18 years ago, reins she still holds today. The family owns almost one-third of the company’s shares. This business has been one of the beneficiaries of the auto industry’s shift towards outsourcing. Its Automotive segment supplies high precision parts for car engines and transmissions. Its skill is to produce them in large volumes at low prices and reliably deliver them to the assembly lines of customers such as Ford, GM and Volkswagen. Investors are clearly concerned that there will be a lot less of the parts Linamar makes in an electric vehicle. That is undoubtedly true, but the outsourcing trend has a long way to go. Most engine and transmission parts are still made in-house by automakers, even in North America where outsourcing is furthest progressed. If anything, we expect acceleration as the Forager Funds Management #8 – Quarterly Report March 2019 big car makers divert investment from conventional powertrains towards electric vehicles and autonomous driving systems. Linamar expects that it can grow its internal combustion engine business in the coming years, with outsourcing wins overwhelming the reduction in total units across the industry. Again the forecast deserves scepticism but the economic argument for continued outsourcing is compelling. It has also been winning contracts for parts for both hybrids and full electric cars. For example, Linamar won two major contracts to produce e-axle gearboxes which combined will represent over one million units a year at full volume, to be produced at new facilities in Hungary and China. SEASONALLY ADJUSTED GLOBAL AUTO SALES HAVEFALLEN ABOUT 10% OVER THE FIRST THREE MONTHS OF 2019, WITH CHINESE SALES CRASHING ALMOST 20%. More importantly, we think the focus on internal combustion engines misses the point. Linamar sees itself as a highly efficient manufacturer of precision parts with relentless focus on return on capital. Car parts is just one application of this skill set, albeit a significant one so far. But it does have two large non-automotive businesses which show there are more strings to the bow. Skyjack is one of the world’s largest manufacturers of scissor lifts, booms and telehandlers for use in industry and infrastructure construction. It’s a cyclical business, more so even than automotive, but faces no existential questions. Skyjack has been owned by Linamar since 2002 and has grown impressively since, both in market share and global reach. The other business, recent acquisition MacDon, makes specialised agricultural equipment such as headers and windrowers, mainly for the North American market at present but the Hasenfratzes have global ambitions. These non-automotive businesses generated 25% of Linamar’s revenue and 40% of normalised operating earnings in 2018. That proportion is likely to grow over time. Linamar trades on less than six times 2018 earnings per share. It’s a cyclical business and so investors need to be particularly careful with price to earnings ratios. Absent a 2009-style economic meltdown, the company should continue to generate truckloads of operating cash flow that can be reinvested in new powertrain technologies and outside the auto sector entirely. And it’s run by an impressive family, with a multi-decade history of success and an unusually sharp focus on return on capital. We have made a significant investment in their continued success. Linamar is the Fund’s 5th largest position representing 5.1% of fund assets. 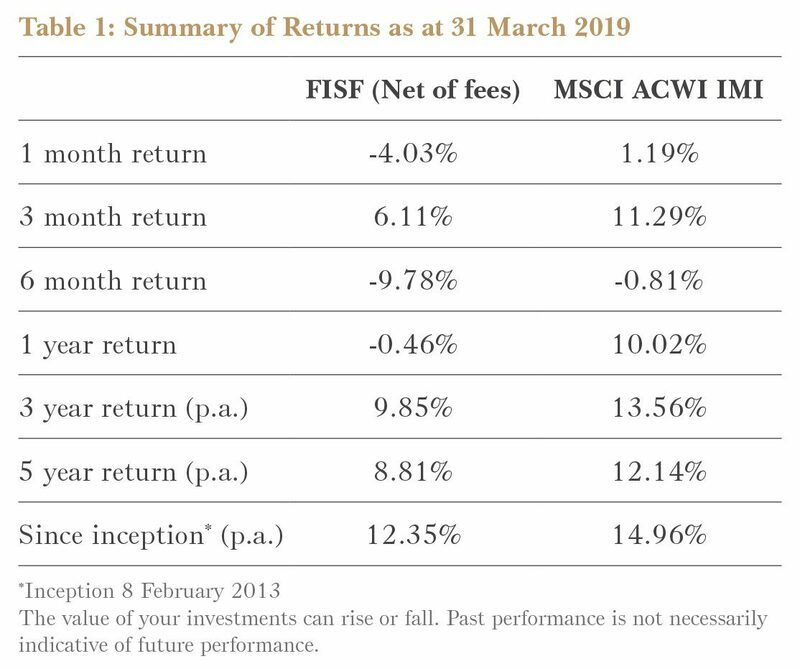 In March annuity provider Just Group (LSE:JUST) reported its results for the 2018 year. Revenue was 15% higher than the previous year and margins showed significant improvement. Demand for retail annuities and the transfer of corporate pension schemes remains robust. Significant further industry growth is highly likely. 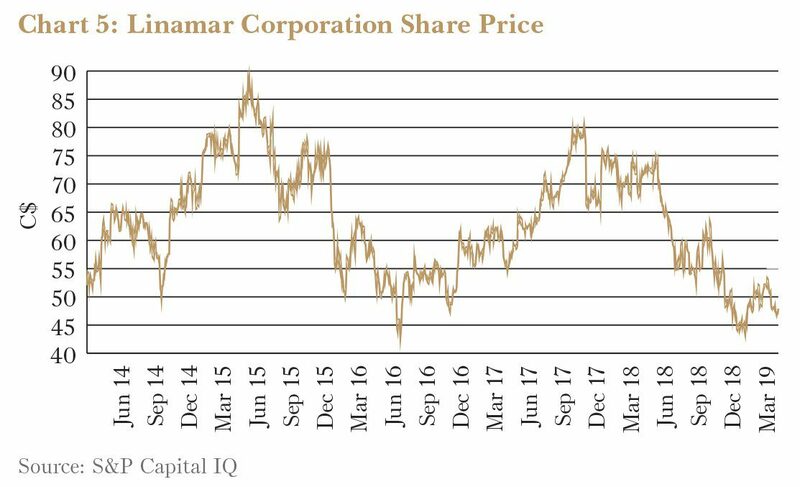 A quick glance at a Just Group share price chart shows that shareholders aren’t reaping the benefits. Its share price has fallen 28% since the result and is now less than half its level a year ago. Highlighting the challenges shareholders face, Just announced a £375m capital raising, including a share placement for 10% of its outstanding shares, at the same time as its results. Little of that capital will go towards future growth. Instead, Just needs it to meet more onerous regulatory demands in relation to business it has written in the past. So we have 10% more shares on issue and an additional £30m in the annual interest bill, with no increase in profits to compensate. Were that the end of it, it would be unfortunate but manageable. There are no guarantees that the regulator won’t demand still more capital, nor that what it has is enough to avoid further dilutive raisings in future. As the business matures it will generate more capital internally and management expects it will be self sufficient by 2022. They also claim to have some plausible sounding plans for reinsurance that would make the business much more sustainable. We will need concrete evidence, though, before regaining confidence that this business can benefit from the opportunities in front of it. Despite a challenging retail environment, sales at Hallenstein Glasson Holdings (NZ:HLG) increased 6% in the six months to February 2019. Most of this came from the Glassons business in Australia, where sales grew 16% in the period. As expected, profitability has come down slightly from its peak this time last year. The Australian store roll-out is progressing slowly with two new stores opened in late 2018 and “a number” of additional stores under consideration. Hallenstein’s strategy is to grow online sales while maintaining a modest store network. Online sales now represent 14% of total revenue, up from 11% last year. Despite its continued growth and profitability, Hallenstein still trades at around 10 times earnings and sports a 9% dividend yield. We outlined the case for Norwegian holding company Bonheur ASA (OB:BON) in the June 2018 report. In short, this developer and owner of onshore wind farm assets, offshore wind installation equipment, cruise ships and other odds and ends was trading well below our sum-of-the-parts valuation. Plenty of European conglomerates trade at large discounts to fair value. But too often those assets are managed sloppily under family control, with little value passing to external shareholders. Bonheur’s history suggested it was different. Thankfully, that trend has continued since the Fund’s investment 18 months ago. Bonheur cashed out of more mature investments at full prices, such as the 49% stake in two Scottish wind farms sold to Aviva Partners. It recently refinanced the debt at 51%-owned Fred Olsen Wind Limited at much lower interest rates, leading to an £87m cash distribution to Bonheur. Some of this is earmarked for cheaper or earlier stage investments, including a new onshore wind development in Sweden and the purchase of a stake in an additional jackup rig (for offshore wind installations) from a distressed seller. The group also doubled its dividend to shareholders in 2018. The stock isn’t compellingly cheap anymore, being up 56% on the Fund’s average purchase price. But we’re happy with its progress. The longest-held stock in the Fund, Italian loudspeaker equipment manufacturer B&C Speakers (BIT:BEC), reported its full year 2018 result with revenue up 35% and net profit up closer to 50%. But that headline result was muddied by the acquisition of competitor Eighteen Sound a year ago, as well as an unusual tax gain. The underlying business is doing reasonably well. Management increased the dividend 19% to 50 cents, and the stock trades on a yield of 4%. This business needs to continue to grow to justify its current stock price, but we’re confident it can. With more market volatility, and cash available, the Fund made three new investments in the quarter. These included two very different businesses in the auto sector—well known used car portal Carsales and recently listed distributor National Tyre. The third was Experience Co, a former market darling operating skydiving and adventure activities. 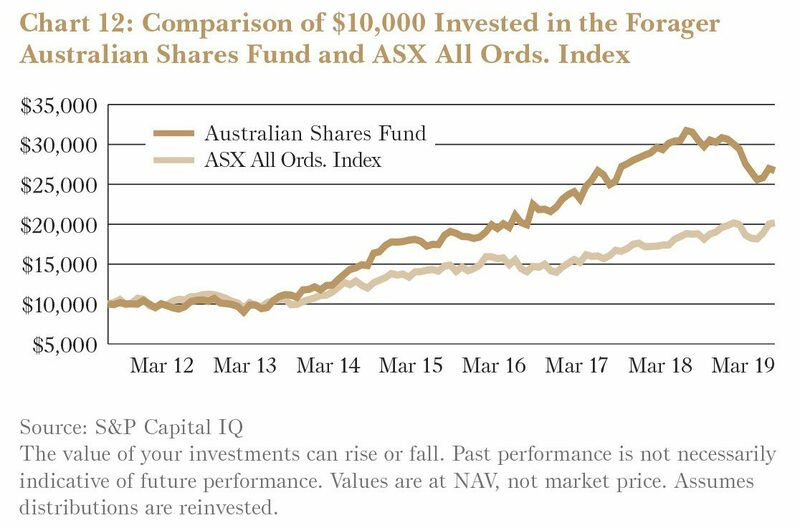 Like the International Fund, the Australian Fund has found some good opportunities in auto-related stocks. New car sales in Australia have been falling sharply over the past year and were down 7.1% in March from the same month a year ago. Share prices of listed auto dealers have fallen too and growth for auto parts retailers has slowed. While there hasn’t been panicked selling for most auto exposed stocks yet, a few opportunities are starting to emerge. Carsales (CAR) is a business that most investors will be familiar with. It operates the dominant online car classifieds website in Australia and owns the number one comparable website in South Korea and 30% of the leader in Brazil. The share price fell by a third during a shaky equity market late last year. In the fear we saw an opportunity. The short term concerns are largely valid: the next year or two could be a bumpy ride. New car sales are likely to keep falling and economic conditions could deteriorate. But we are confident that the business will be making a lot more money ten years from now than it is today. This will come from increasing its role in the automobile market and getting richly rewarded for its efforts. Advertising costs dealers about 9% of the gross profits earned on each vehicle sale. This has room to increase significantly. We’ve talked to a lot of used car dealers. Almost all said Carsales accounts for more than 80% of their leads and there isn’t a viable alternative. If you don’t spend on Carsales you won’t sell the car. Online classifieds have made the search process for a new car easier. Customers now only visit two car dealerships before purchasing a car compared to four dealerships six years ago. As car buying has become increasingly digitised, the leading digital portal will increase in importance. Profits will continue to grow. Carsales is not trading at a multiple Ben Graham might call a bargain. But revenue and profit should grow by at least 5% a year over the next ten years. And the business does not need much capital to grow, paying out 80% of its earnings as dividends for a yield of 4%. We’d expect to make a very reasonable 8-10% annual return from the dividend and steady growth. There is also plenty of potential upside from the international businesses. South Koreans sell four million used cars per annum, similar to Australia. Carsales made $75m in revenue from Australian dealers last half. SK Encar, Carsales’ subsidiary and the market leader in South Korea, made only $29m. But it grew by 26% and has a lot more growth left in the tank. The other auto exposed stock in the portfolio is a much lower quality business, but with a valuation that compensates us well for the investment’s risks. National Tyre and Wheel (NTD) has had a very troubled start to listed life. In November 2018, less than a year after listing, the company told investors that profit was shaping up worse than expectations. Margins were down. Costs were up. Investors, sceptical of the small, recently listed, and unproven business, sold aggressively. The share price fell 42% on the day of the downgrade, capping off a 60% fall in just three months. With expectations low and a valuation reminiscent of global financial crisis levels, the Fund bought 5% of the company. National Tyre mostly distributes Cooper tyres to specialist tyre retailers around Australia. The brand is a niche replacement tyre favoured by the off-road crowd—think those big fourwheel drives going for a leisurely drive through the Simpson desert. The number of four-wheel drives in Australia has been growing at more than 5% a year for close to a decade and is likely to continue growing. The company has been building the Cooper brand in Australia since getting the exclusive rights to import and distribute in 1989. The arrangement works well for brand owner and manufacturer Cooper Tire (NYSE:CTB). Australian marketing, warehousing and distribution is all handled by National Tyre. Like most distributors the company operates on low margins. A tyre sold to a retailer for $100 cost the company $67 last year. After another $23 per tyre of fixed operating costs, profit before tax was only 10% of revenue. That means small changes to buying and selling prices can have a big impact on profits. This was the cause of the company’s recent issues. Cooper increased tyre prices and the Australian dollar fell (the company buys tyres in US dollars). Expectations are now for pre-tax margins of only 7.4%. 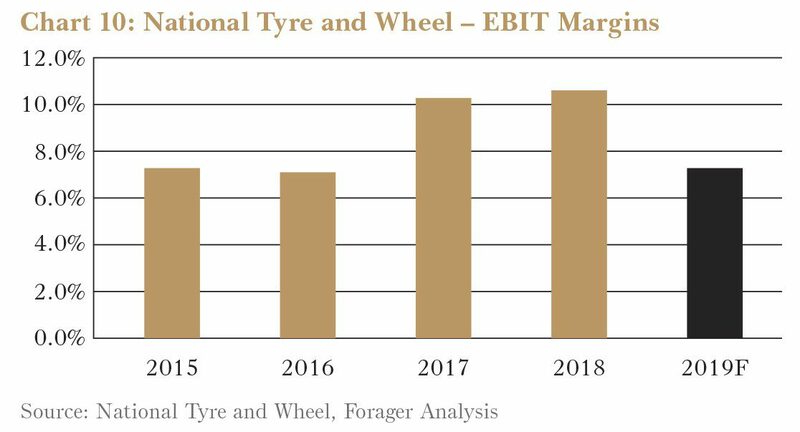 While it has already passed on some of the impact to its own clients, for National Tyre to pass on the full increase, the competitive and consumer environments need to improve. But that doesn’t need to happen for the Fund to make a good return on its investment. Even with the assumption of low margins National Tyre is trading at a price to earnings ratio of six times. Expectations were so low that a further downgrade of full year profit expectations in February was greeted with an increase in share price. As profit stabilises market valuation should improve. And if profit margins improve the company will prove that it’s far from a lemon. At 8:51am on the 13th of February, Experience Co (EXP) released an “update” to earnings guidance. The company had not traded for two days and investors were expecting the worst. The announcement contained little good news: earnings for the half year were lower than expected, full year earnings were revised down 20% and the company’s leadership was stepping aside. In the first hour of trade Experience Co’s share price was down more than 40%. After watching for months, in the distress the Fund bought 3% of the business. This wasn’t the first issue the company had faced. Experience Co, then known as Skydive the Beach, was a market darling in 2017. The skydiving and adventure activities operator traded on a price-to-earnings multiple of 20 times. Then there was an accident at Mission Beach in Queensland resulting in three fatalities. A few months later there was another fatality in New Zealand. There had been one tandem fatality every year and a half for the last decade: here were four fatalities in three months. Not surprisingly, the number of people wanting to jump out of a plane waned. The company’s new adventure division also struggled. Over 18 months Experience spent $108m to acquire mostly Cairns-based businesses operating white-water rafting, helicopter tours and reef trips. Too many businesses were acquired too quickly. These have underperformed since acquisition. 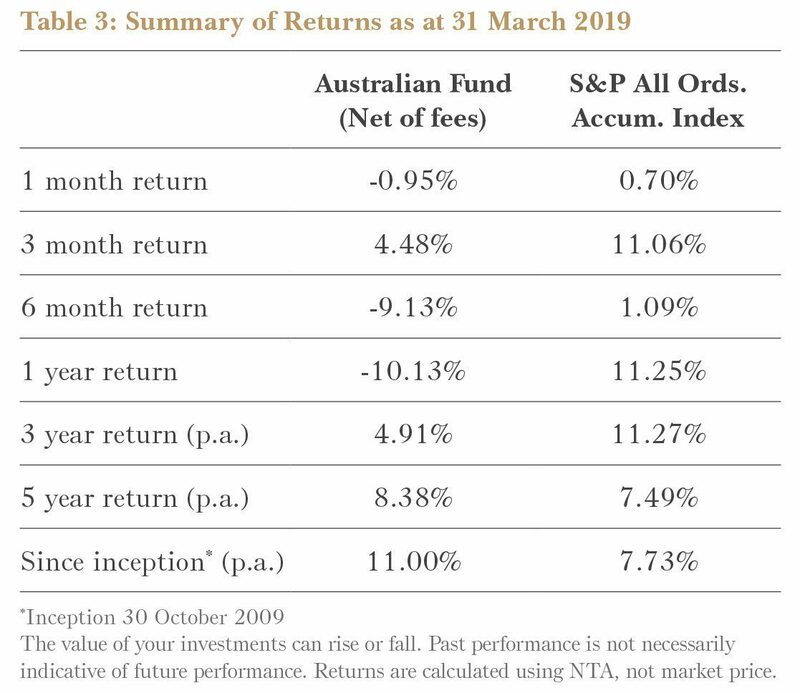 So why was the Fund buying Experience Co when most others were selling? Despite recent issues, its skydiving business is good quality and growing. It was built up from one location in Wollongong in 1999 to become the largest operator of skydiving in Australia and New Zealand. 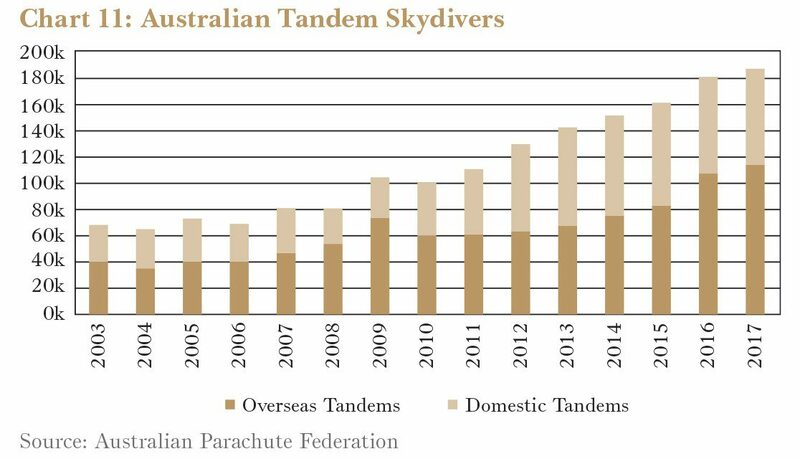 Experience Co’s market share of tandem skydivers in both countries is around 70%. The growth in the number of skydivers has been almost as exciting as the jump itself. In the past decade the number of jumpers has increased by almost 9% per year. Tourists now make up more than 60% of jumpers. While safety will always be a concern when jumping out of an aeroplane, taking a skydive is about as safe as driving 1500km on Australia’s roads. THE BRAND IS A NICHE REPLACEMENT TYRE FAVOURITE OF THE OFF-ROAD CROWD: THINK THOSE BIG FOURWHEEL DRIVES GOING FOR A LEISURELY DRIVE THROUGH THE SIMPSON DESERT. Despite some problems, the adventure division is not a write-off. It is still profitable, though not to the extent prior management were hoping. Poor weather and high airfares have been impacting Cairns tourism. In February arrivals to Cairns airport fell 7%. Over the prior five years arrivals are up 4% per year. A return to trend would help the business recover profitability. Founder and managing director Anthony Boucaut will step back into a non-executive board role once a new CEO is found. He has built Experience Co into what it is today and still owns a third of the company. While the business won’t be run by a well incentivised founder/manager, the now bigger Experience Co requires some different management skills. Chairman Bob East, an experienced tourism executive, is running the business for now. He has already improved the quality of information presented to shareholders. A new chief executive officer should be appointed soon. Following that panicked first hour the share price is up over 80%. A clear and informative earnings presentation has restored some market confidence. Well managed growth should see Experience Co experience a resurgence. Comparison website iSelect (ISU) exited two underperforming business units. The home loan division was restructured and a Cape Town contact centre closed. Home loan employees will be transferred to iSelect’s new partner, mortgage broking group Australian Finance Group (AFG). This will allow iSelect to focus on generating mortgage leads. The Cape Town contact centre has been fielding calls for energy and telco comparisons and doing a poor job of converting leads to customers. Bringing these back to Melbourne will improve conversion. Next year’s profit should benefit from the changes. Troubled finance company Thorn (TGA) updated investors on key issues for the business. A loss of $6m for the current year is now expected to be $8m, with more Radio Rentals customers delaying payments. The company may also write down the value of future payments due from customers. Thorn’s bankers reacted by reducing the company’s access to extra corporate debt. Importantly, Thorn has launched a strategic review to make significant changes to the business. This could involve a full or partial sale. It could also involve the wind-down scenario we discussed in the December quarterly report. Both would be an improvement on the current loss-making course. We continue to engage with the Board of the company to realise Thorn’s value. Administration provider Mainstream Group’s (MAI) announced net profit was unimpressive, falling 75% for the most recent half year. Costs were higher as the company paid staff with shares and funded the growth of a US-based private equity administration business. But revenue grew 32% including acquisitions and 21% excluding them. It now administers 19% more funds by number and 10% more by value than a year ago. The company stuck to earnings guidance, expecting further growth in the second half of the year. Mainstream is continuing to build a highly recurring and valuable business. NZME (NZM) reported its results for a difficult 2018. Big brands who place advertising with NZME publications and radio stations reduced their spending as Kiwi business and consumer confidence fell. Revenue from the company’s print and radio divisions fell 4%. But digital revenue continued to climb and the company is working on some important changes to the business. A paywall for premium online articles, successfully used by other newspapers online, is expected to be launched this quarter. And OneRoof, NZM’s real estate classifieds portal, continues to rapidly gain ground on its larger competitor TradeMe Property. OneRoof and other digital expansions cost the company about NZ$11m this year for revenue of less than NZ$1m. It should be money well spent. The last half was a slow one for West Australian courier and warehousing services company CTI Logistics (CLX). Revenuerose 27% as acquired businesses started to contribute. But profit was down 9% from the same period last year. The company is bearing a few short term costs as it merges twoacquired businesses, reduces the number of properties it leases in WA and expands on the east coast. Spending on these costs now will make for a stronger business when the WA economyeventually improves. Offshore oil and gas equipment manufacturer Matrix Composites & Engineering (MCE) raised $3m from shareholders in December last year. Revenues were little changed from the prior corresponding period and the company is still loss-making. But Matrix has been making progress. The value of future work already secured from clients rose from US$19m to US$27m. And revenue expectations for the full year are $35m to $40m, which should be enough for the company to at least see it break even. While some new products may generate revenue next year, Matrix remains a cheap option on the long term recovery of offshore oil and gas spending. Crane operator Boom Logistics (BOL) reported stable revenue for the latest half year. But under the surface the company is making progress. An industrial dispute in November cost Boom $3m as some staff in NSW were given pay rises of 50%. Without this disruption, profit before interest and tax would have doubled. That would have put Boom on a path to earn reasonable returns on the fleet of cranes the company owns, something it hasn’t done for five years. The business still trades at approximately half the value of its net assets. MSL Solutions (MPW), a provider of software to clubs and sporting venues, announced a disappointing first half earnings result. The company’s recurring revenues grew 15% but sales of hardware products fell 25%. Costs increased substantially faster—product development and marketing costs were up 38%. Management blamed the increasing costs on investments in initiatives as diverse as retirement living and Dubai’s 2020 World Expo. After spending more cash than the company was paid, MSL was left with only $1.4m in the bank. The business will need to demonstrate a turnaround for shareholders to justify further investment.